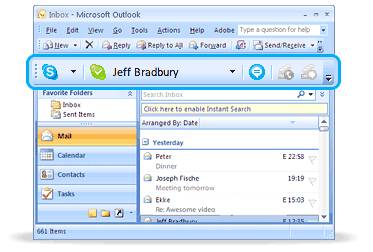 Skype Email Toolbar for Outlook allows you bring all your Skype and email contacts together in one handy place. You can make Skype calls to people who have emailed you and even call those not using Skype with SkypeOut. Skype Office Toolbar allows you place calls and send the file you are currently working on via Skype. The toolbar recognizes phone numbers within your document and lets you call them using SkypeOut or send SMS messages. * Start calls to Skype Names and phone numbers written within MS Word, Excel and PowerPoint documents. * See when the author of a document is online and communicate with them. * Send the file you are currently working on to Skype Contacts. * Turn phone numbers into links within your document.